Floor area with soft play and Bouncy castle, preschool music will be played and our disco lights will be on. Children will be supervised by the parents. 1 hour in the gym, 30 mins in the party room. Available on SUNDAYS. Pre-school parties are structured similar to our Seahorse class. Preschool parties are ran on Tuesday at 12.30pm-1.15pm in the gym and 1.15pm-1.45pm in the upstairs party room. Fully structured party with full use of the gym. Children will warm up, play games, be taken around the apparatus for fun gymnastics activities and then have free ply at the end enabling them to go on any of the equipment they choose. 1 hour in the gym, 30 mins in the party room. Available on SUNDAYS. You will have access to the party room 30 minutes before the start time of your child’s party. This will give you time to set up. Children will have use of the party room for 30 minutes following the gym party time. Either a pink or blue seat cover for the birthday child. A broom and a black bag will be provided. A drop in voucher, for all children attending the party – valid weekdays and school holidays. Parties are available for a maximum of 20 children. All children aged from crawling to 16 years are included in the total party numbers. We cater hot food & cold food at an additional charge however parties are also welcome to carter cold food for themselves. Maximum of 20 children for party food. Please let us know if you have any special requirements and we will do our best to cater to your needs. Parties at Dolphina book up fast and availability is limited. To book a party please call us on 01923 800158. Alternatively please email us using dolphinagymclub@gmail.com with the following details and our Party organizer will get back to you as soon as possible with availability! 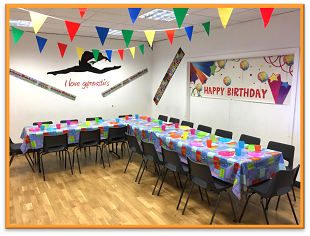 Our Parties are run on Sundays from 11am and preschool parties on Tuesdays at 12.30pm- 1.45pm. Maximum of 20 children. Once you are happy with all the party details we would require a deposit* of £100 to secure your preferred day and time. The remaining balance would be due one month before the party date. Please note: Due to popularity of dates we are unable to temporarily hold party dates. *All deposit payments are non refundable.